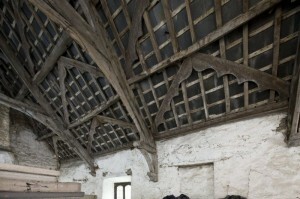 Different building traditions developed in different regions of Wales during the late Middle Ages, as Peter Smith has made clear. In the east and the border regions houses were generally built in timber, with wooden frames on a stone foundation, whilst in the coastal areas and the west building was mainly in stone. Betweeen these two regions a further tradition developed of building composite houses with timber frames and partitions, and external walls of stone. Timber frames were not only structural; they were carefully crafted and contributed towards the decorative interior of houses such as Cochwillan. Other decorative features of the new houses of this period were stained-glass windows and fireplaces. The masonry work in grand residences such as Raglan castle and Coldbrook was also extremely elaborate. Guto’r Glyn’s poems praising Coldbrook, Vaynor and Sir Siôn Mechain’s house in Llandrinio (poems 22, 38 and 85) and requesting slates from Rhisiart Cyffin ab Ieuan Llwyd (poem 61) reflect the growing importance of the construction industry in Wales. Website design by Martin Crampin Website development by Technoleg Taliesin Cyf. and Alexander Roberts, Swansea University.